Do you yearn for more physical activity in your life – perhaps a sport from your youth? You may have a secret passion for something you have not yet tried. Opportunities abound at any age, so why not explore them? There is a world of friendly competitive sports out there for the senior athlete, be you a novice or from the world of the elite. From alpine skiing to weightlifting, there is a sport (or two) for each of us. Many organizations open opportunities to train and compete with those in our own age group. To offer you a smattering of those, let’s start with the Senior Games. The National Senior Games Association(NSGA) offers competition at the state and national level in 20 different sports categories for athletes age 50 or over. Athletes compete in games at the state level in even numbered years, i.e., this year and meet the minimum performance standards shown on the website in order to qualify to go to the national games in the odd numbered years. Contact information for each state is listed on the NSGA website. The 2019 national games will be in Albuquerque, New Mexico in June 2019. You will have plenty of company as the national games usually draw 10,000 – 12,000 participants. Sound interesting? Take a look at the state game schedule. Not every state offers every sport and most states will allow qualifying for out-of-state athletes. For example, my state doesn’t offer road racing, so in past years I have participated and qualified at the Delaware State Games. The Huntsman World Senior Games have been around for more than 30 years and hold competition in 20 different sports. Where NSGA changes the locations of the biennial games, the Huntsman Games are held annually and always in Utah. Again, they are open to athletes age 50 and over, through 100+ years. The Huntsman Games use the NSGA minimum participation standards. Contact, registration and information on each of the sports offered is available on the Huntsman website. Where other organizations catering to senior athletes offer a variety of sports, USATF is specifically track and field events, which still provides a wide variety of venues. The Masters category starts at age 30 with USATF. Keep in mind though that competition is held within 5-year age groups. Currently, I’m in the group Female AG 70-74. USATF Masters events are held regionally and nationally. Information on international venues for Masters is also available on their website. Many organizations have events locally, regionally, nationally and internationally. If travel is one of your joys, sports make a wonderful excuse to take a second vacation. After your competition or training, spend a bit more time in tourist mode, kick back and enjoy. And while you are busy preparing for your event, the rest of the family can take in some local color. By example, several of my siblings accompanied me to Senior Games in Minneapolis one year where they happened across hundreds of bicyclists coming down the street in the ‘Freedom from Pants’ Bike Ride, which was pretty much like it sounds. We followed that up with a much more sedate evening with the Minneapolis Orchestra accompanied by a choir from Cuba. Get your family and friends into the spirit. I’ve seen two and three generations of families supporting their senior family members in competition. After many seasons of freezing on the sidelines or sitting on hard grandstand seats in support of your children or grandchildren, give them the opportunity to be there to cheer you on. What an example you will set. Websites that cater to senior athletes offer inspirational articles about people like ourselves who have been late starters or recently renewed their interest in sports. Others offer information on training specific to the older athlete, in addition to health-related issues. If you are not yet ready to jump in as a participating athlete, attend and enjoy any of the above as a spectator. USATF has the most accessible regional competitions with many indoors where there is the opportunity to witness our counterparts sharing competition and camaraderie. What do you do to stay fit and healthy? Have a chat with your health care professional and get the green light. If you have recently embarked on a new activity or participated in a senior competition, what was your experience? Please share it with us in the comments below. This is an adapted version of my article previously published on http://sixtyandme.com. Occasionally, a day is well spent just watching athletes do what they do. Rather than lining up at the start or supporting a friend through a race, its great just to observe and cheer. So it was today when we set out at 7 a.m. to arrive at Lac Tremblant for the 8:00 swim start of Ironman 70.3 Mont-Tremblant. It was warm for an early summer morning when the Laurentian Mountains usually require a light jacket. The sparkling, flat surface of Lac Tremblant, helicopter overhead, fighter jets making a pass as the pros made their way into the water, was a beautiful and exciting start. We stayed at the beach until the 50+ women left the shore (these are my people). From the beach, we walked a trail to the base of Mont-Tremblant where the swim/cycling transition takes place. By the time we reached the transition area, the pros were already on the bike course. We cheered age-group participants as they emerged from the water, searched for their bike location, made any wardrobe changes and took a bit of nutrition before biking off. We then found our way to an excellent breakfast, lazily relaxing until we conjectured the first finishers would begin arriving. This spectator role is beginning to grow on me. Before the finish area became too crowded, we left the comfort of the restaurant’s terrace and found a shaded view near the finish. Last year’s winner Lionel Sanders (Canada) finished first with a time of 3:47:31, nearly five minutes ahead of second place Trevor Wurtele (Canada). Trevor’s wife Heather placed as second woman (4:17:08, 15th overall). First woman finisher was Holly Lawrence (Great Britain) with an impressive time of 4:08:53 (10th overall). Deciding that five hours of observing was enough and with other commitments calling, we walked back to the shuttle for a ride back to the parking area. As the bus slowly made its way on Chemin de Village, we could see many of the age groupers on the hilly run course. It’s a beautiful route, but under an unusually warm sky at 1 p.m. and little shade, runners were having a tough go. Cooling sprinklers were set up along this portion of the course and I could see aid stations and medical tents along this section of the route were well supplied. I lost sight of runners as they looped around the train station (now an art gallery) and on to the Petit Train du Nord trail to their turnaround. For the first time during the day I felt uneasy, sitting in relative comfort of a shuttle bus as runners were struggling and toughing it out through those last few miles. Checking online results, I see two women in my age group (F65-69) finished the race (6:30 and 7:59). Were in not for a lack of swim and cycling expertise, I would love to be doing this event with them. I hope every participant has an opportunity post-race to soak in the great food and beauty this region has to offer following their hard-earned finish. How often does the opportunity present itself to enjoy a number of the most fulfilling things in life in a single weekend? Things like family, friends, flowers, food, travel, music, and, of course, running. 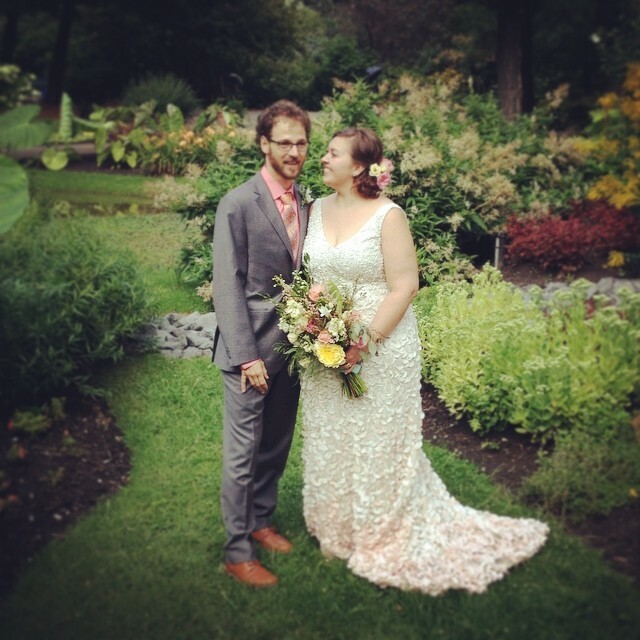 All this was wound around wedding activities of my godson and his beautiful bride in the vibrant city of Montréal. 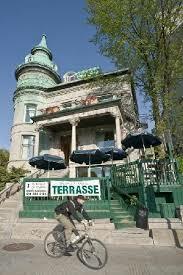 If Montréal is not on your “cities I must visit” list, please consider adding it. And since the wedding couple shared a few favorite restaurants and other locales during their Wedding Week, I will in turn share them with you. Nil Bleu – An Ethiopian restaurant with beautifully presented food and a soft ambience. The pre-wedding day dinner was relaxed as we casually worked our way from the appetizer tray to many other courses that followed. The details of each course escape me now as I was enjoying seeing old friends and meeting new. Never fear, though. This recent review in MontrealResto captures the ambience of Nil Bleu, as well as the aroma and flavor of the food. La Toundra was the locations of the lovely afternoon wedding surrounded by blooming gardens and a Grand Prix race course (we arrive not in a Formula 1 but in a taxi). After a beautiful ceremony and reception, we called it a day and returned to Hotel de Paris, our charming, historic lodging. It’s a great location, modern amenities in each one-of-a-kind guest room, and close to all of the wedding venues. Should you be adventuresome enough to decide on something more interesting than what the major chain hotels can offer, this is a good choice. But, come in good shape on the off-chance (ahem) you are assigned a 3rd floor walk-up room. 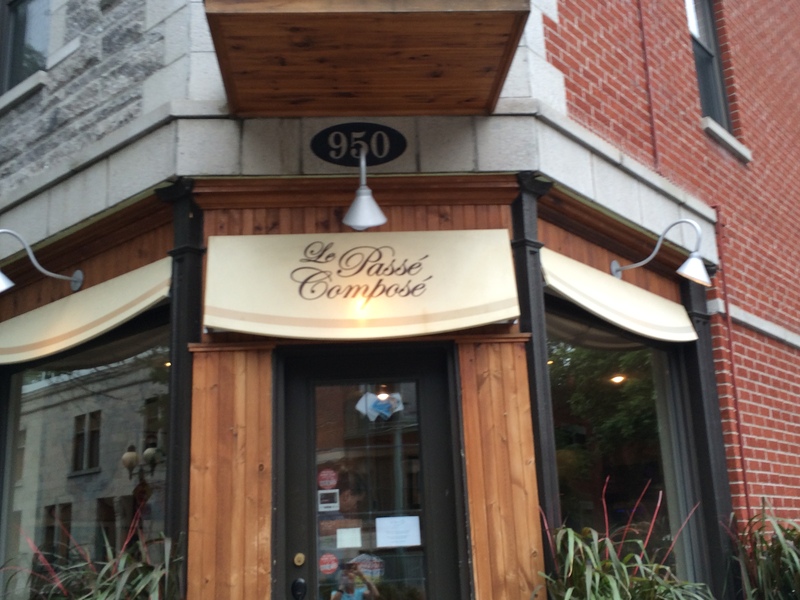 Le Passé Composé – A post-wedding day brunch was arranged at this wonderful corner bistro with art-covered walls, large windows, old wood flooring, and of course wonderful food. It was a casual morning crowd and an inviting menu. I stayed with the traditional tête a tête, eggs and bacon with rich brown toast and fruit on the side. My husband chose a salmon omelette. Both choices were fresh and wonderful. If I have an opportunity to return, I will try le crêpe encrusted with panko. 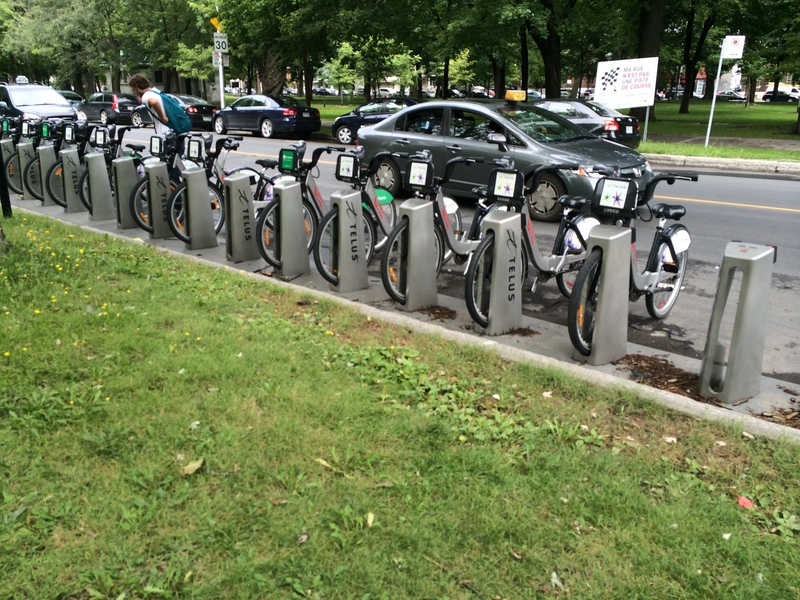 Bike share stations like this at edge of La fontaine Park dotted throughout the city. and offers playgrounds and ponds, as well as walking and cycling paths. I opted out of the potine, but instead (yes, you guessed it) spent my park time squeezing in an 8-mile run. The locale offered interesting views since most of the park perimeter is surrounded by colorful residential areas and small shops. And not to overlook the opportunity for music, the evening took the mother of the groom, my husband and I for a stroll down rue Sherbrooke to McGill’s Pollack Hall (where by the way the bride and groom had spent many a day studying and practicing). An evening of string quartet performances rounded out our stay. And as quickly as we arrived, we were again crossing Montréal’s bridges, seeing signs of an early autumn as we passed through the Adirondacks – and home again. Seriously, consider visiting Montréal. We can compare notes. With many travel tales and trails still untold, a run along a hometown towpath reminded me of how much I enjoy my local trails. 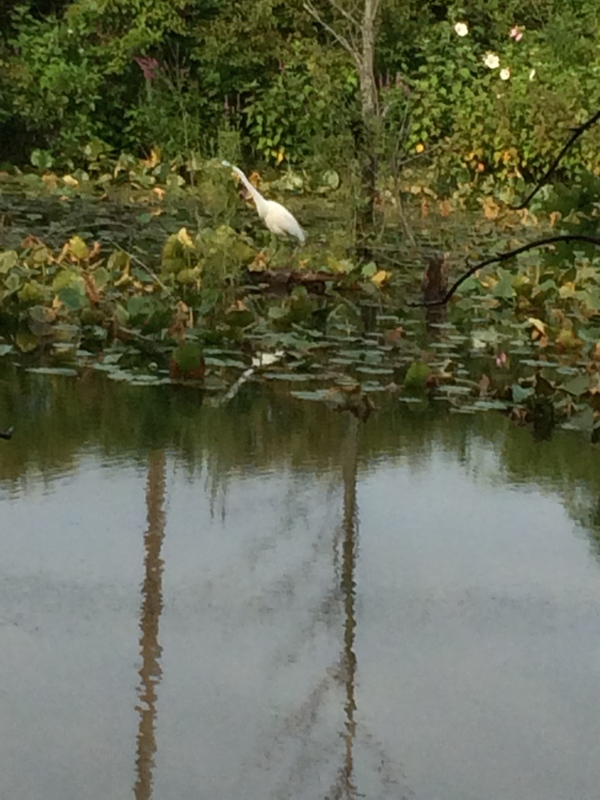 On my first run in Wildwood since my return, the fowl and flowers seemed as exotic as anything I experienced abroad. The time I had planned to run a 4-miler was reallocated as I stopped for photos every couple hundred yards. Movement and beauty bid me walk and watch. The 4-miler became a 2-miler. 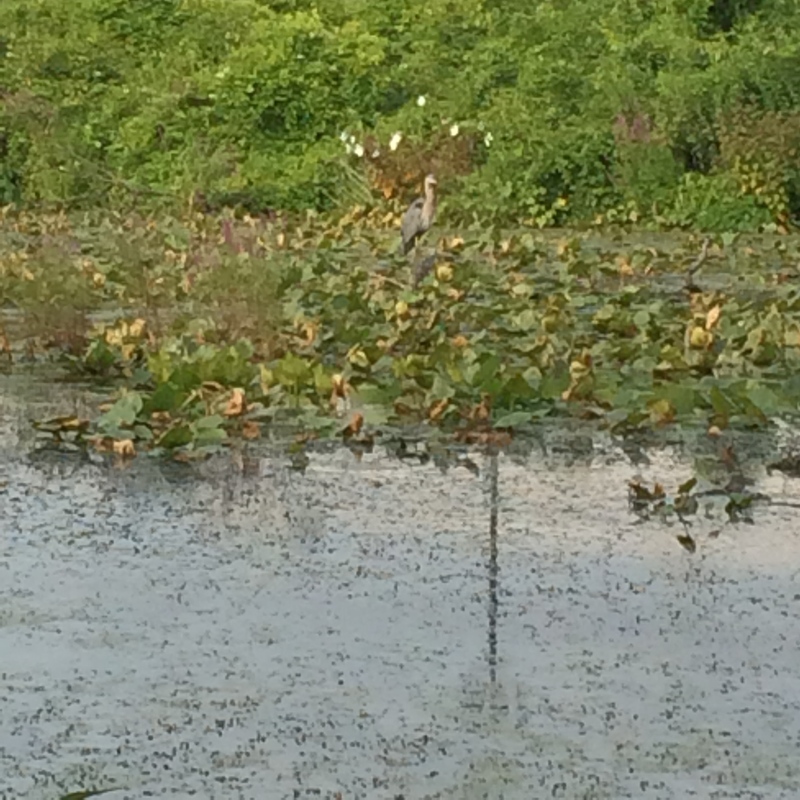 Color and form camouflage the gray heron as it hunts for food amongst the swamp waters. Armed only with my iPhone, the several photographers with long lenses, camouflaged themselves in the greenery at the edge of the path, are surely getting better results. 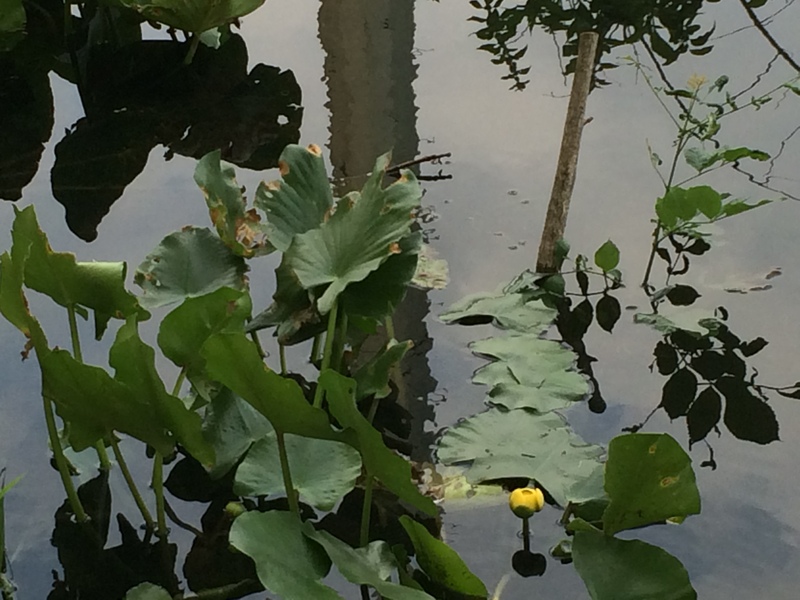 The swamp lily is looking lovely in summer yellow. Lacking the protective coloring of the heron, this spunky great egret stared at the camera then ducked its head to troll the grasses after two of its buddies took flight. I wasn’t fast enough to catch their impressive in-flight wingspan. 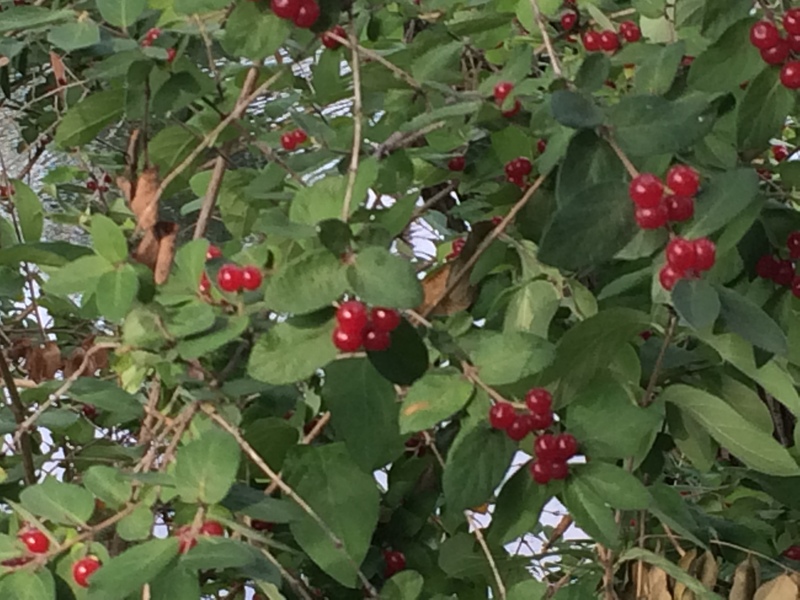 The honeysuckle dominates the wild grape, both reaching for light on this shaded path. Give nature an opportunity and it will thrive. A heavily truck-trafficked street is mere yards away with an industrial park on the opposite side. 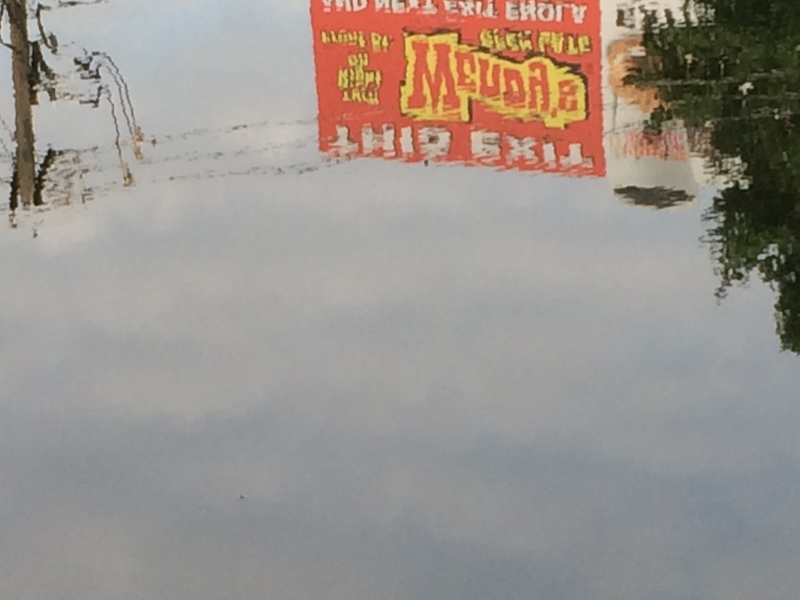 The Wendy’s billboard is seen reflected on the swamp’s surface. It’s good to be back on a familiar and favorite path – for now. Traveling my way and looking for a nature run, walk or bike ride? Find the towpath and other trails on this link to localeikki. Next week, its back to trails and tales along the Baltic. 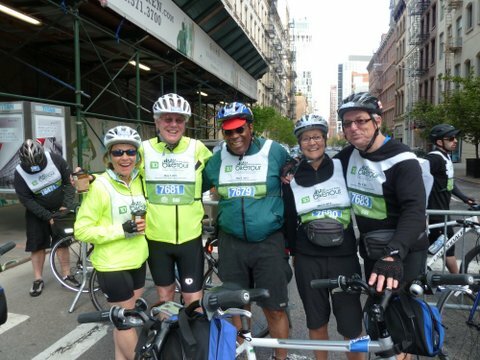 Bike New York’s TD 5-Boro Bike Tour is once again upon us, Sunday, May 4. I won’t be there this year, but am wishing good weather, a good ride and good eats to my friends who will be. Maybe I’ll consider 2015. 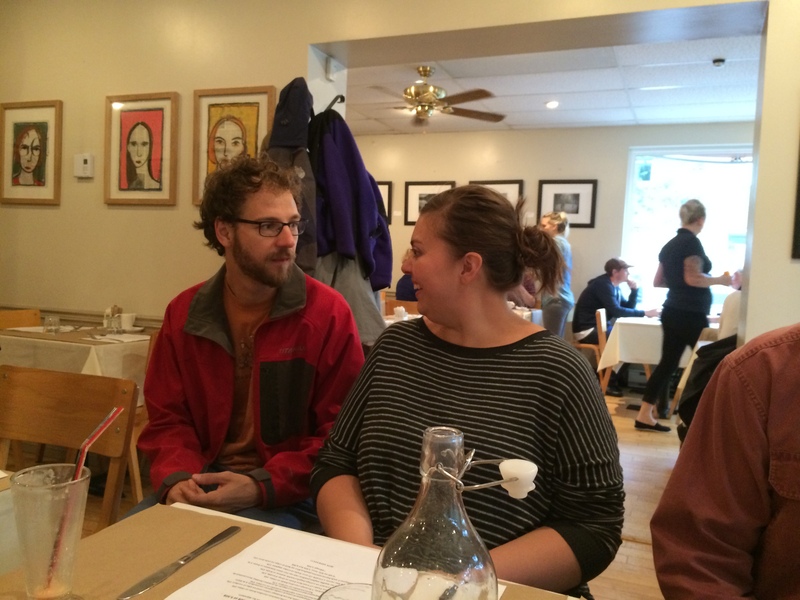 And, maybe I can convince fellow travelers to do a repeat of some of the wonderful food stops we enjoyed last year. A 40-mile bike ride and a 4 a.m. volunteer stint required adequate nutrition, and what better place to find some good eats than New York City. 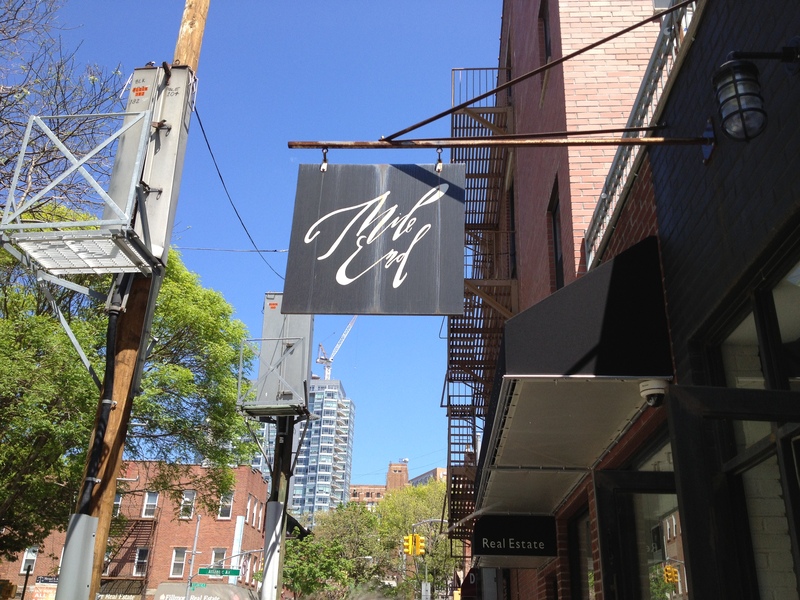 Mile End Deli: This Brooklyn eatery, walking distance from The Flea, has a walk-up carry-out window and a sit-down dining area that accommodates 20- 25 people max. Most of our group ordered smoked meat sandwiches, making comparisons with the smoked meat at Montreal’s delis. I ordered a hot dog along with a a side order of slaw and frites, which were flavorful and plentiful. La Silhouette An evening meal took us to a Manhattan restaurant familiar to friends Phyllis and Mike from her days of living in New York. I have since heard this restaurant closed in late 2013 and no word on it reopening. Pity, because it had a wonderful ambience, a varied menu with beautifully prepared entrees, particularly seafood dishes, and service that was flawless. Joe G’s Following a long and chilly day for our five cyclists, three of our crew opted for comfort food and a cozy restaurant. We chose this below-street level restaurant near our hotel. At Joe G’s you will find dark wood, white tablecloths, pleasant staff and a selection of Italian dishes perfect for four tired senior athlete travelers. If you give any of of our dining choices a try, please let me know if you agree. 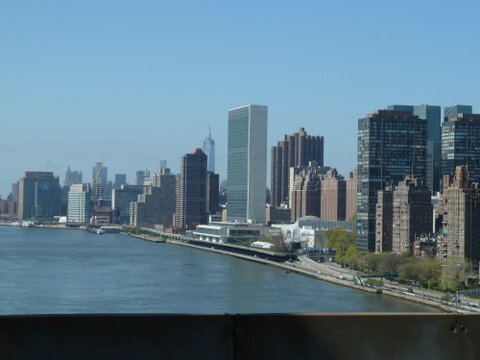 For me, I can’t wait to return to New York for the sights, the food and the athletic events. And maybe next time, I will step out of the volunteer t-shirt and onto two wheels. Before I return to NYC for the 5-Boro Bike Tour, I will be making my way through the five boros at the 2014 New York City Marathon. I’m looking for some additional dining choices and will be building my list early. I’ve already received recommendations for Brooklyn’s Grimaldi’s pizza. Any other suggestions out there? To avoid the Capital 10-Miler post-race wrap-up chores, I’m indulging in wanderlust. Helped along in that quest by Cirsten’s blog, My Writers Block, where she explores the history of Amsterdam’s residents and buildings, my memories wander to my own brief exploration. and spend a night on dry land. An option for our last day was to stop in the Van Gogh Museum or the Rijksmuseum down the street from our hotel in Amsterdam. I had only managed a couple of brief runs during our cruise (unless you’re counting my many laps around the ship’s upper deck). While my sister enjoyed an early cup of coffee, I opted for the outdoors, letting her know I’d be returning in an hour or so. 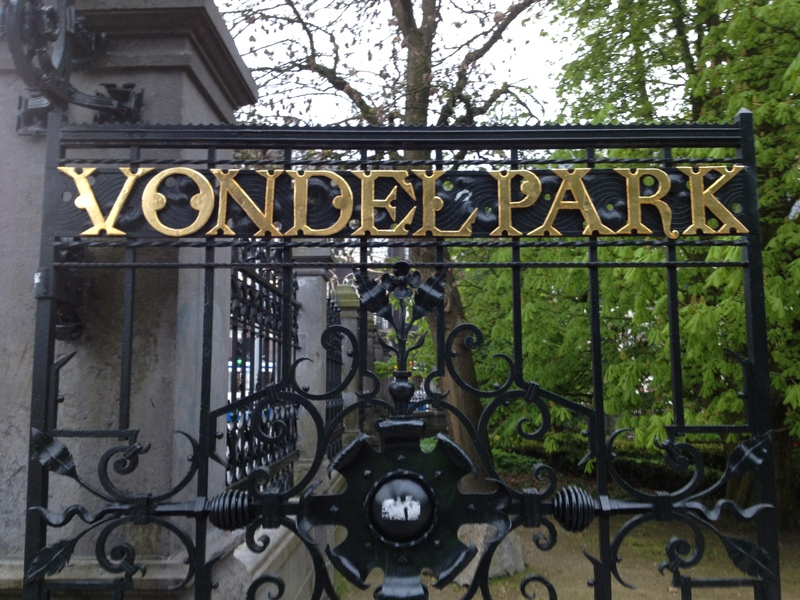 The front desk directed me down the street to Vondelpark. Entering the park through a beautiful gate, I ran under an overhead walking bridge and took a look back to identify landmarks for my return. 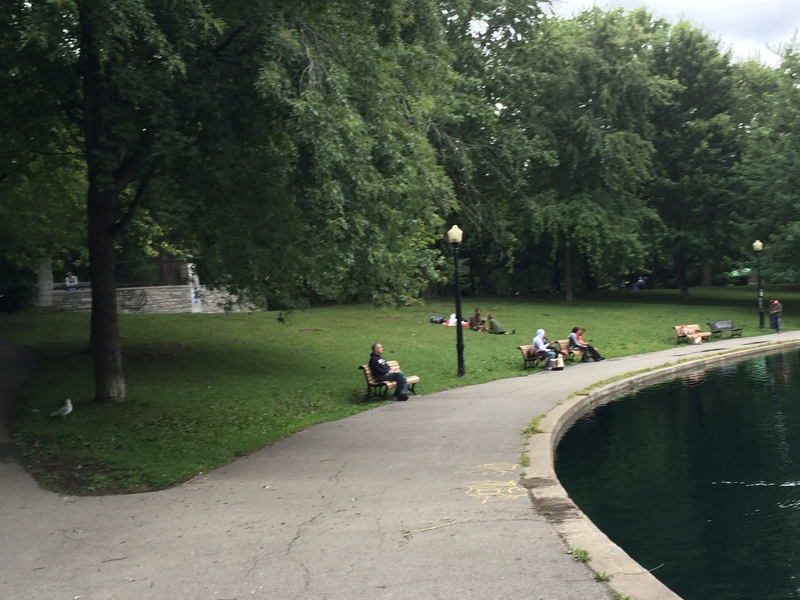 The park path appeared to be a circle, a circle of beautiful old residences, inviting outdoor restaurants, people walking dogs, more people riding bicycles. Bicycles loaded with children on the handlebars and on extra seats, bicycles with business riders – briefcases stashed in their pannier, bicycles with spandexed riders. I noticed I was seeing the lovely homes and inviting outdoor restaurants a second time. How had I passed my landmark exit with the beautiful gate? I turned around, backtracking. How does one get lost on a circular path? One more time around and still no gate in view. O.K. Now the panic begins. Is my sister looking at her watch wondering why I haven’t returned? Will I find my way out of this beautiful but perplexing piece of land in time to make our flight? Am I feeling a little panicked? Do I pick an exit and hop in a cab back to the hotel? I spotted a park diagram posted nearby. While trying to identify my exit, an Amsterdam native out for a run and speaking fluent English asked if I needed help. Oh yes, I need help. Please point me to the ornate gate with the park name. We jogged together back to that somehow hidden gate, comparing running histories, families and travel. Why hadn’t I seen the overhead walkway or the gate? Well, my entrance was not actually on the circle, but was a dog leg leading to the circle. Waiving good bye to the kind stranger, I returned, once again passing under the overhead walking bridge and through those beautiful gates. I returned to find my sister packed up and dressed, relaxed, reading a magazine with no idea that my outing had been a bit adventurous. She looked so calm, it would have been unkind to share. park, even in a state of panic, trumps a museum. While writing a follow-up to last year’s walk through the athletic wear closet, I picked up on a NPR Radio series from the program Planet Money. It shed new light on my process of identifying where my clothing, particularly my athletic wear, is made. In this series, Planet Money follows the making of a men’s Jockey T-shirt from cotton fields in the U.S. around the world in Asia, with finishing in Columbia, South America. The least percentage of cost in the t-shirt followed around the world was the labor. The Restrepo quote gives a bit of bite to my holiday shopping joy. How this consumer (and gift recipient) fits into the picture is puzzling on two fronts. First, am I helping or hindering by not purchasing or suggesting items made by workers earning wages that barely provide food and shelter? I struggle with that. Second, I’m not a numbers cruncher, but if we must go around the world to make a cheaper t-shirt, or high-end sportswear, how is it that I can buy excellent quality running apparel from companies that manufacture in the USA at a comparable price? With those questions unanswered but worth considering, I again provide a brief list of brands that are primarily manufactured domestically and sometimes locally and offer quality products. They are durable and nearly everything on my list is still in my closet and wearing well. Keep your running apparel away from the fabric softener and a hot dryer and it wears a long time. Keen Footwear is located in New Hampshire and manufactures a variety of footwear items. 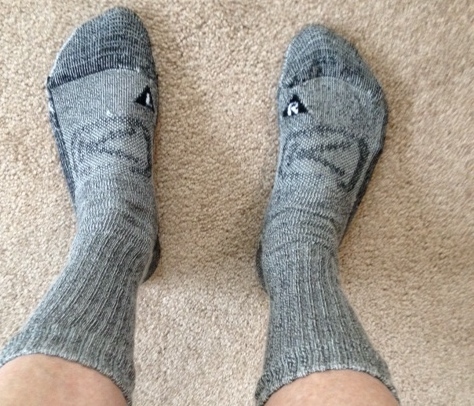 The socks I recently purchased are made of imported merino wool and manufactured in New Hampshire. Affordable, lightweight and warm for winter running. They keep my feet warm in my running shoes and my toes stayed cozy while snowshoeing earlier this month. Handful Bra, a company that manufactures sports bras for fitness enthusiasts, is moving operations from overseas to the United States with a base in Oregon. Their move was financed in part through crowdsourcing. Their sense of humor is apparent on their home web page. Darn Tough, another sock company I love is located in Vermont. I shopped early and took mine into the snow and crisp winter air. That’s my list for this year. 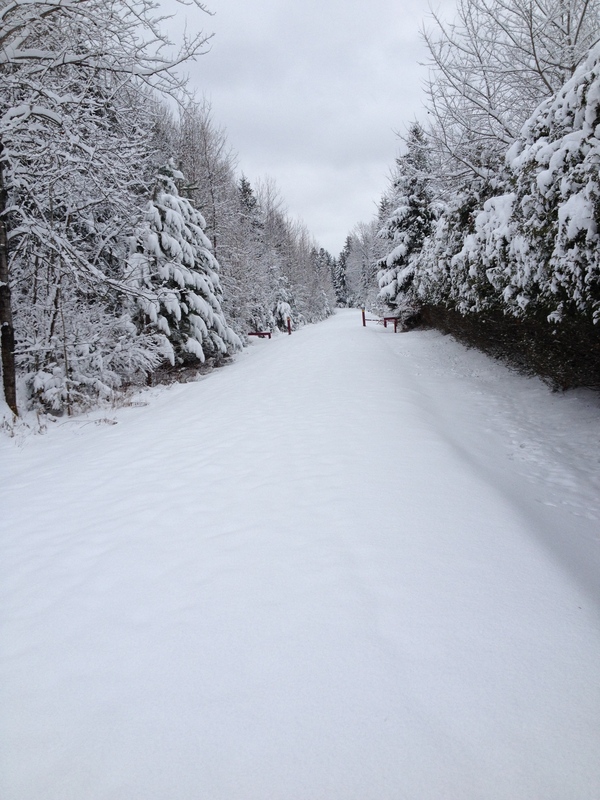 Enjoy your gifts and the gifts of the season on your runs, walks or rides in the great outdoors.